June 17 Porgy and Bess VIP Night! The Justice Theater Project joins with 38 theaters from across the state of North Carolina to present a marathon staged reading of all of the works of William Shakespeare, in honor of his 400th birthday. 24 hours of FREE Shakespeare performed in five days! Join The Justice Theater Project at 3:00 AM on Monday, April 25th as we sing, dance and drink a lot of coffee. Afterwards, join the cast at the iHop on Hillsborough Street. Shylock: Fred Corlett - A Jewish moneylender in Venice. Angered by his mistreatment at the hands of Venice’s Christians, particularly the merchant Antonio, Shylock schemes to get revenge by ruthlessly demanding a pound of Antonio’s flesh as penalty for Antonio’s defaulting on a loan. The Christian characters in the play regard Shylock as an inhuman monster, frequently mocking him for being obsessed with money. In person, however, Shylock comes across as far more than a caricature or stereotype. His resentment at his mistreatment, his anger at his daughter’s betrayal, and his eloquent expressions of rage make him a convincing, entirely human character. Portia: Regina Brooks - A wealthy heiress from Belmont. Portia’s beauty is matched only by her intelligence. Bound by a clause in her father’s will that forces her to marry whichever suitor chooses correctly among three caskets, Portia nonetheless longs to marry her true love, Bassanio. Far and away the cleverest of the play’s characters, Portia disguises herself as a young male law clerk in an attempt to save Antonio from Shylock’s knife. Antonio: John Honeycutt- The merchant whose love for his friend Bassanio prompts him to sign Shylock’s contract and almost lose his life. Antonio is something of a mercurial figure, often inexplicably melancholy and, as Shylock points out, possessed of an incorrigible dislike of Jews. Nonetheless, Antonio is beloved of his friends and proves merciful to Shylock, albeit with conditions. Bassanio: Jeffrey Nugent - A gentleman of Venice and a kinsman and dear friend to Antonio. 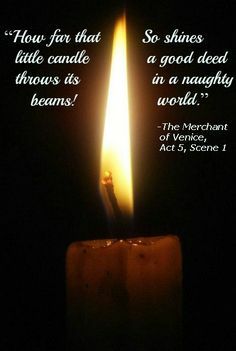 Bassanio’s love for the wealthy Portia leads him to borrow money from Shylock with Antonio as his guarantor. An ineffectual businessman, Bassanio nonetheless proves himself a worthy suitor, correctly identifying the casket that contains Portia’s portrait. Gratiano: Michael Lester- A friend of Bassanio’s who accompanies him to Belmont. A coarse and garrulous young man, Gratiano is Shylock’s most vocal and insulting critic during the trial. While Bassanio courts Portia, Gratiano falls in love with and eventually weds Portia’s lady-in-waiting, Nerissa. Jessica: Emily Johns- Although she is Shylock’s daughter, Jessica hates life in her father’s house and elopes with the young Christian gentleman Lorenzo. Launcelot jokingly calls into question what will happen to her soul, wondering if her marriage to a Christian can overcome the fact that she was born a Jew. We may wonder if her sale of a ring given to her father by her mother isn’t excessively callous. Lorenzo: Matthew Kershaw - A friend of Bassanio and Antonio. Lorenzo is in love with Shylock’s daughter, Jessica. He schemes to help Jessica escape from her father’s house and eventually elopes with her to Belmont. Nerissa: Nora Kelly - Portia’s lady-in-waiting and confidante. Nerissa marries Gratiano and escorts Portia on Portia’s trip to Venice by disguising herself as Portia’s law clerk. Launcelot Gobbo: Me Me Cowans-Taylor - Bassanio’s servant. A comical, clownish figure who is especially adept at making puns, Launcelot leaves Shylock’s service in order to work for Bassanio. The prince of Morocco: Moses T. Alexander Green - A Moorish prince who seeks Portia’s hand in marriage. The prince of Morocco asks Portia to ignore his dark complexion and seeks to win her by picking one of the three caskets. Certain that the caskets reflect Portia’s beauty and stature, the prince of Morocco picks the gold chest. The prince of Arragon: Vincent Bland - An arrogant Spanish nobleman who also attempts to win Portia’s hand by picking a casket. Like the prince of Morocco, however, the prince of Arragon chooses unwisely. He picks the silver casket which is incorrect and receives a message telling him so. Salarino: Drina Dunlap - A Venetian gentleman, and friend to Antonio, Bassanio, and Lorenzo. Salarino is often almost indistinguishable from his companion Solanio. Solanio: Verlene Oates - A Venetian gentleman, and frequent counterpart to Salerio. A Venetian gentleman and messenger. Salerio returns with Bassanio and Gratiano for Antonio’s trial. The Duke of Venice: Barbara di Ciero - The ruler of Venice, who presides over Antonio’s trial. Although he is a powerful man, the state he rules depends on respect for the law, and he is unable to bend the law to help Antonio. Gobbo: Rock Kershaw - Launcelot’s father, also a servant in Venice. Tubal: Maria Barber - A wealthy Jew in Venice and one of Shylock’s friends. A wealthy Paduan lawyer and Portia’s cousin. Although Doctor Bellario never appears in the play, he gives Portia’s servant the letters of introduction needed for Portia to make her appearance in court. Balthazar: Erin Folk - Portia’s servant, whom she dispatches to get the appropriate materials from Doctor Bellario. Stephano: Katie Barrett - A messenger who works for Portia. Leonardo: Katie Koop - One of Bassanio’s servants. The Justice Theater Project is a professional theater in Raleigh, NC that combines hard hitting theater with advocacy, discussion and outreach. We present an annual holiday production of "Black Nativity" by Langston Hughes each Christmas, and mentor youth every summer at our summer theater camps. Art Inspiring Change. All shows and camps are in different locations - please check each web page for each event. Become a Season Subscriber TODAY for fee-free ticketing, great customer service, and all additional tickets at the low group rate. One Seat for ALL six shows in our 2019-20 Season “From Monologue to Dialogue: Open Communication Opening Minds” Enjoy fee-free reservations via email or phone, beginning one month prior to each production. NEW! Pick 3 of your favorite shows during the 2019-20 season. Enjoy fee-free reservations via email or phone, beginning one month prior to each production. Donate today and provide seating for JTP’s nonprofit partners attending all shows, and tuition assistance for the $14,000 given every summer during our youth summer theater camps. Thank you!